Since 1926 The Train Station has welcomed newcomers to Kelowna and seen friends and family reunited. Nothing’s changed, except that we now offer great food, craft beer on tap, and Okanagan wine. The Train Station is a Kelowna Pub known for it’s comfortable food, hearty burgers, and fresh, healthy salads. 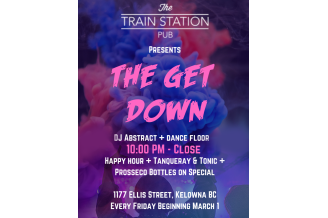 The Train Station Pub fosters an environment that is friendly, connected, and authentic to downtown Kelowna. Visiting The Train Station Pub, you know you’ve arrived.